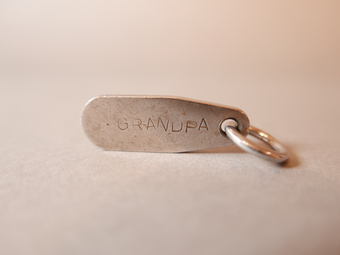 My Grandpa was a quiet man in a noisy household, a furniture restorer and a maker of things. I was a little shy of him. I made him this key ring in secondary school metalwork lessons in about 1983 or 84. When he died in 2005 my Gran gave it back to me from his keys and told me how he had treasured it all those years. They are both gone now and I keep it on my keys as a reminder of them both, and of the quiet pleasures found in making and giving things. Thinking about my grandparents, both of whom were artists and makers, and how they met and married during WW2. My Grandpa was a New Zealander who came to the UK for an adventure in 1938, ended up joining the Navy and never went home. I only found out the story of his war experiences after his death. To me, he was a quiet man in his workshop, which smelt deliciously of turpentine, oil and wood shavings. Plus, as a writer, I love artworks that play with the visual possibilities of the written word.